I personally will never go back to genetic skins. Sorry. Second Life evolves and I keep up with it, even if I do disappear for a year at a time! 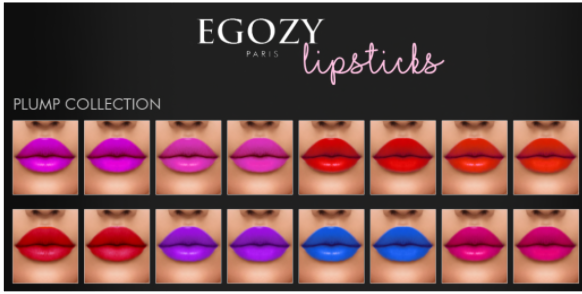 Egozy to be worn with the "Annie" mesh head by Catwa. This is the Face that has different color eyebrows or none. I am new to the Catwa head and couldn't figure how to wear these without the alpha from the eye lashes blocking the color of the eye shadow. And then there are a lot of different lip choices. The naturals are my favorite yet. Bold colors to make a statement! The plumps make your lips even fuller! Here I am showing some of the lipsticks and glosses. I really like this skin and head combination and will be wearing it for a nice chunk of time. Also worn are the "BB Eyes" collection also from Egozy. See you all on the EGOZY Marketplace!